Our all brass four-poster bed is grand in scale and proportion, true to its 19th century English heritage. Still made as it was over a centuy ago. Handcrafted from pure brass, the finish will mellow with age aquiring the lovely patina for which brass is renown. Review: "I had wanted a brass bed for my bedroom in my small Victorian house ever since we moved in 11 years ago. Charles P. Rogers was the very first website I visited, and the Hyde Park was the very first bed I looked at. I knew it was the exactly right one for me. . . . . and it was! It was delivered in a timely manner in perfect condition. My son-in-law assembled it with only one small glitch, which was soon overcome with help from Customer Service. 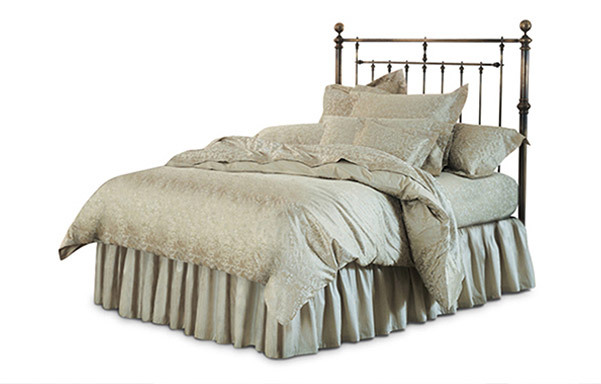 The looks and quality of my antique brass bed exceeded my expectations; the quality is wonderful. Now, with the Victorian style flowered glazed chintz bed ensemble, including a quilted, scalloped, straight bedskirt, I am completely thrilled with my "new" bedroom."